Help, how to topics > Print reports > How to print a list of books that have biography in subjects? How to print a list of books that have biography in subjects? How to create a report with a list of books in my library that have Biography in any of the subject fields? 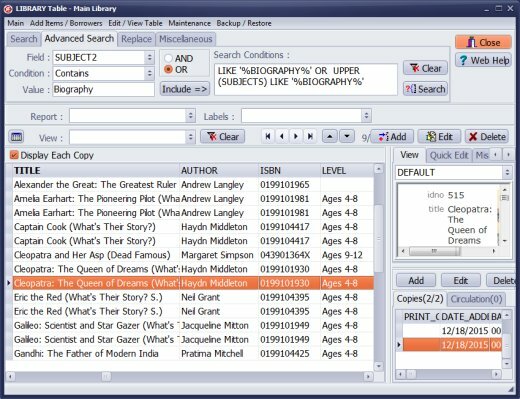 Open Library Main Catalog window. Select SUBJECT1 in the Field box, select Contains in the Condition box, and enter Biography in the Value box. Click Include. Repeat above instructions for SUBJECT2, SUBJECT3, and SUBJECTS. Before you click Include make sure that OR operator is selected. Click Search to execute. Only items that have biography in Subject1 or Subject2 or Subject3 or Subjects will be displayed in the window. Click on the Default Sort button. In the Default Sort window select the primary sort field CATEGORY, and then select the secondary sort field CALL. To check the order of your records move the mouse pointer over the Default Sort button. The popup note displays the current sort. review: how to sort library items? Select TITLE, AUTHOR, CATEGORY, CALL data fields. Click on the Main tab and enter report name. Click Quick Preview to check the layout of the report. Question: I am trying to create a report with a list of books in my library that have Biography in any of the subject fields. I want it to include Title, Author, Category, Call Number. Ideally I'd like it sorted by Category and then if possible, by Call number. When I go to define the report I do not see the Call number as a field I can add. I also am confused by the different views. Why are the field headings different depending on whether you select Display Each Copy or not? I always want the CALL number to show, but I only can see it over o the right hand window not the main window view. There must be a way to do this? Question: I'd like to print a report of all the books in the Reference Category sorted by Call Number. How do I do that? 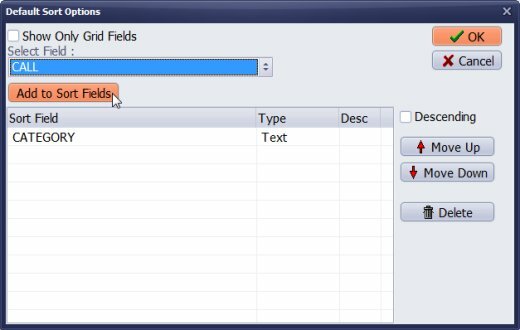 I can see that I can sort records by the first few fields that show on the screen by clicking on the column heading, but since the Category field is deeper than that I can't figure out how to do it. Is it possible? 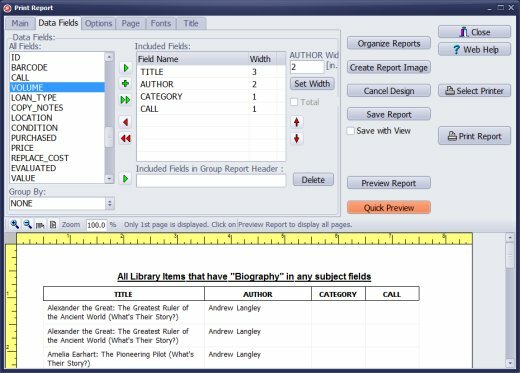 Answer: Use Advanced Search to display only Reference books, click Print Report, and select New Report.